Developmentally he is right on track and Dr. Bo kept saying how good he was being and how secure and social he is. Oscar just had a great time haha. Especially ripping up the paper barrier on the exam table! One thing that was a little concerning is that the fat rolls on his legs didn’t quite line up. Apparently this can be a sign of the hip not fitting together properly so we have to take Oscar for an x-ray. The Dr. really didn’t seem concerned about it and said it was a precaution but definitely something worth checking out sooner than later. I spent about 5 minutes Google-ing the ‘what-ifs’ in this scenario and that was enough. Infant hip problems are scary and time consuming, not to mention sometimes painful to fix. I am not going there. Not gonna freak out. Just going to get the x-ray and move on. I hope! We’d welcome any prayers that this will just be a blip in an otherwise glowing report from the Doctor! So maybe I am a little worried. 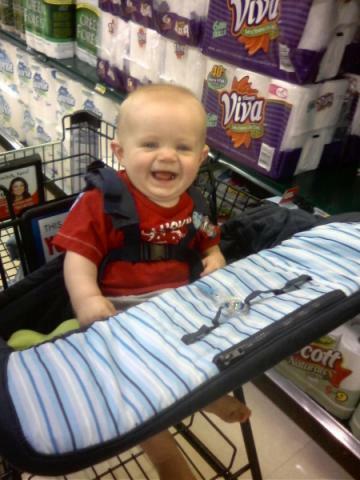 We went to the grocery store and Oscar had his first trip in the seat area of the cart! How can I make this sweet little boy have an x-ray??? Emma's but cheek creases don't line up. I mentioned it to her doc~he did a little exam and didn't think it was anything. We never got x-rays…..hummmm. I will keep y'all in my prayers. It's a blessing to have doctors that are so careful, but it's also scary when they are just checking.. I'll pray for you all. I don't think any baby has EVER enjoyed grocery shopping that much. Oscar is so cute – the grocery cart made Micah cry. I have never heard that about leg creases! We will pray that everything turns out OK and you have peace along the way. thanks ladies! We had the x-ray and he did awesome…should hear back in a couple days!